WaveSub 182/2 is a passive versatile subwoofer which complements the rest of the loudspeakers with a powerful and deep bass. The Subwoofer can be used in stereo with speakers with a SPL between 79 - 81 dB (2.83V, 1m). 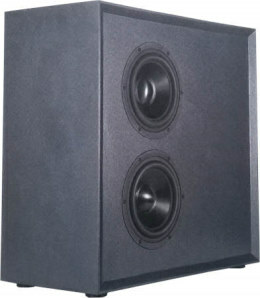 WaveSub 182/2 is a loudspeaker with drivers of Wavecor . Passive radiators provide deep bass. The kit is delivered with two of Wavecor SW182BD04 woofers and two of Wavecor PR182BD2 passive radiators. At medium volume, i.e. 90 dB at 1 m, the nonlinear distortions are below 1% above 100 Hz. The high-end kit is delivered with baked varnish air core coils on important parts of the crossover for minimizing microphonic effects. - The current flow through the coil creates a magnetic field which sets the reel of wire in motion. This motion induces a voltage in the coil which adds itself to the signal. The stiffer the reel of wire is, the less the signal will be altered. The capacitors for the Wavecor SW182BD04 mit Wavecor PR182BD2 are of type polypropylen (MKP) Clarity-Cap PWA 160. The kit WaveSub 182/2 you can get with different crossover frequencys. The quality of the crossover parts is in all kits the same like the 100 Hz version, only the values are different respective to the crossover frequency.